With the crowdsourcing of an entire downtown’s revitalization in Bristol, Connecticut, it’s important that each person’s face-to-face experience reflects their online experience, and vice versa. For instance, in the face-to-face meetings, people individually mention the kinds of public amenities and retail destinations they’d like to see in the downtown. 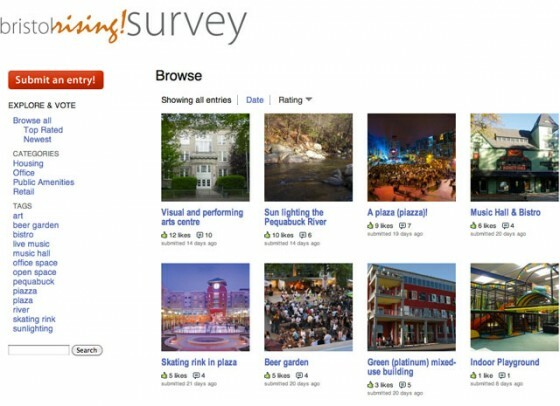 The next step involves identifying the most popular or repeated suggestions, like say, a piazza, a skating rink and a beer garden. The crowd then breaks into those groups to brainstorm how they’re going to go about building a pre-market for their favorite amenity, so that the participating developer and city government partnership is confident in investing in it. In conjunction with the meetings, the developer-city partnership determines and communicates to the crowd a threshold number of supporters needed to do a feasibility study, followed by the number needed to justify actual pre-development, and ultimately investment. Online and in between the meetings, the crowd continues building the following toward the threshold marks for the most popular ideas, as well as submit new ones, on a visual crowdsourcing website platform such as Bubbly. You can see this in use at Bristol’s crowdsourcing website, bristolrisingsurvey.com, though understanbably, you need to demonstrate some kind of stake in the city to ‘vote’ and comment. Bristol members are working to recruit people as we speak to hit the minimum number of ‘likes’ needed to trigger the successive levels of development (to be determined by the developer). Even the comments will soon be rated by ‘likes’, helping inform the crowd why these are good ideas while filtering out those comments that are less helpful. In this case, the online crowd/user experience parallels the offline one, resulting in the user experience they’ve been seeking all along… a sense of community both online (an active, campaigning social network) and offline (a revitalized downtown).